It's the 120th birthday of the Eiffel tower. So I thought Id take a look at some handmade Eiffel inspired ideas to add a little je ne se qua to your home. These little plastic Eiffel charms are everywhere and come in a big variety of colours. Try making earrings, necklaces. These two are from Shock Treatment in LA. US$2.25 for two. To celebrate the Eiffel Towers birthday, creative monsoon is offering free shipping on one of our most popular prints, 'Love Paris'. Visit our etsy site for more. US$30. The keep calm and carry on posters just keep on churning out. Here is another variation, 'Keep calm and visit Paris' good idea, why not! 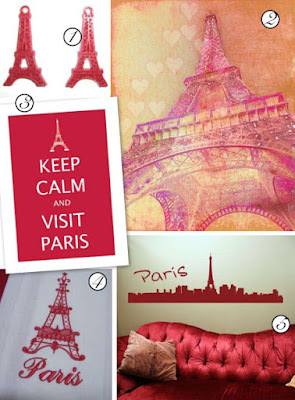 Loads of colours to choose from US$19.50 from Visit Paris.